Friday was another lazy day leading up to the game. I got up around 11:45, given, I didn’t go to bed until two or so. I got some stuff done around the house, mainly replying to emails and cleaning my room up, so I can at least find stuff, maybe. I had called my former high school Calculus teacher, Mr. Johnson, on Thursday, and asked if he wanted to join me for Friday’s game. We’ve been friends since I graduated back in 2005, and I see him about twice a year. He’s a really great guy, and was a laid back teacher in a topic that is anything but laid back. I was somewhat of the class clown (while still getting A’s), and there are a bunch of lines I can recite from that class that are hilarious, but I’ll choose one. One day Mr. Johnson (AKA “Dr. J”) was drawing some functions on the dry erase board, and the equation came out to be “KY = “. He then asked the class, “What does KY equal?” I tentatively raised my hand and answered quite confidently “Jelly.” It garnered quite a bit of laughter, and Mr. Johnson thought it was funny as well. He told me that when he gets to that lesson each school year he thinks of me. Goal of being remembered? Accomplished. 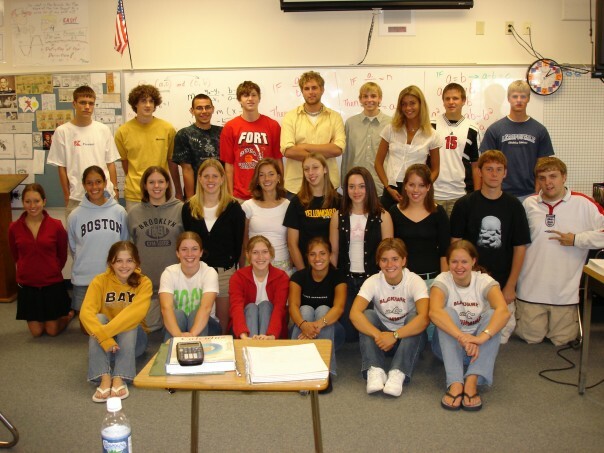 This is a picture of my Calculus class, back in 2005. I’ll let you figure which one is me (it should be easy), I’m not too happy with the picture, but I am comfortable with making fun of myself. I picked up Dr. J at his house in Fort around 4:15 and we headed to Milwaukee. We hit some Friday rush hour traffic and weren’t parked until 5:50 (it’s normally an hour drive). 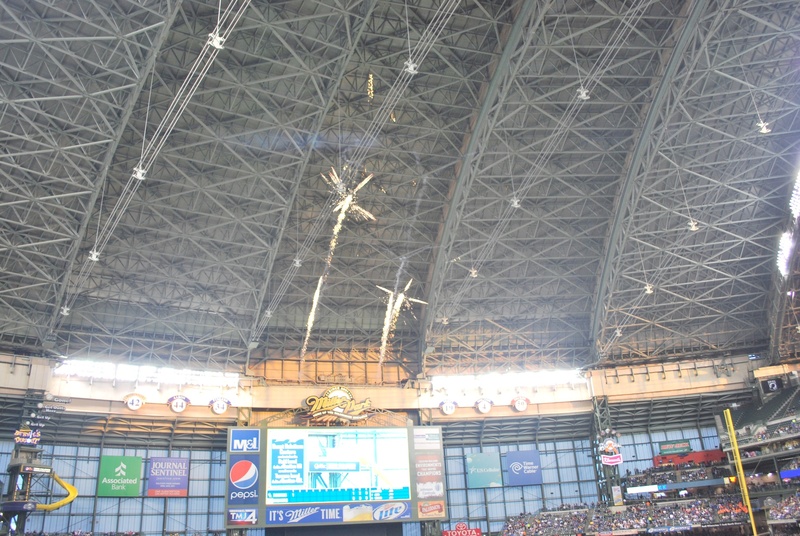 We got inside and went to the upper deck, again, for game photo number 14. We talked in the upper deck for a while, then went to the concession stand to get brats and beer. I still don’t know why they only serve Miller Genuine Draft on tap at a few select concession stands. It has the word DRAFT in it’s name. I went with High Life instead, which is alright, but I prefer MGD. We made it to our seats right after the national anthem. I quickly devoured my brat (with all the trimmings), and was ready for the game. The cute moment of the game occurred when the play ball kid was put on the jumbotron. As the camera cut to him, you could hear him ask quietly “Say it now?” The answer must’ve been yes, because he quickly said “PLAY BALL”, good stuff. 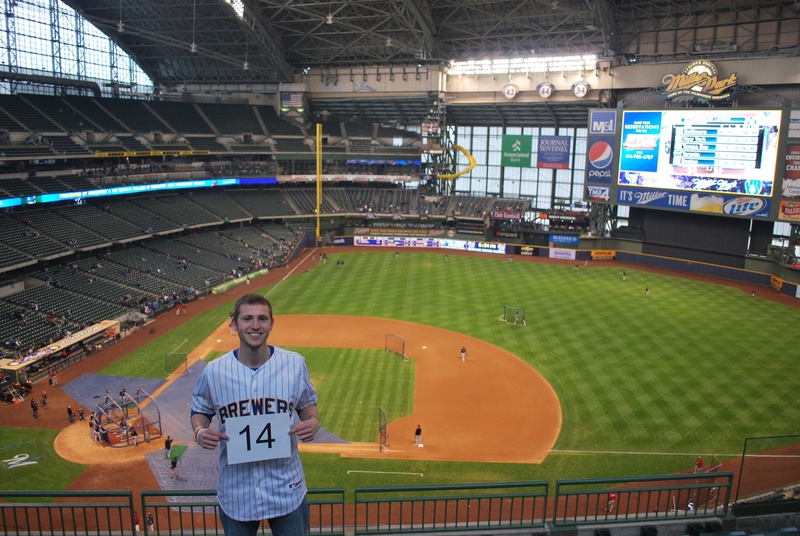 I was a little nervous after hearing Marcum’s warmup music as the Brewers took the field. The song was ‘Till I Collapse, by Eminem, featuring the late Nate Dogg. I don’t know if he used this song all of last year, but I know he had it played as his warmup music for game six of the NLCS. He got shelled in that game, giving up four in the first and getting pulled after the inning. I think it’s a great song for warmup music because it gets you pumped, but it brought back some bad memories. It didn’t help that the Rockies grabbed an early 1-0 lead in the top of the first (maybe it helps get the batters pumped, instead of Marcum himself). Between the top and bottom of the first the Brewers try to get everyone excited for the first at bats for the home team. At the end of a short video montage they shoot off fireworks over the scoreboard in center. When the roof is open they fire them more skyward, but it’s still fun when it’s closed. In addition to the ones you can see below, they also fire off some sort of apparatus that sounds like canon being fired. If you’re sitting in the right field bleachers and you don’t see the fireworks going off, it can sometimes be quite startling to hear the booms of the fireworks that don’t produce any visuals. I’ve jumped a few times when sitting over there. The Rockies held the 1-0 lead into the fourth, when they tacked on another solo run. The Brewers however, with the help of a risky dive by the Rockies left fielder, scored a run in the bottom half. Aoki lifted a sinking liner to left, where Carlos Gonzalez dove for it, and just barely missed. The ball went to the wall and Aoki wound up with an inside-the-park home run. I think it’s the first I’ve seen in person, but I’m not 100% sure. The Rockies added another run in the sixth, but the Crew tied it in the bottom half with two runs of their own. It stayed tied into the ninth, when the Rockies got to Axford for a run. 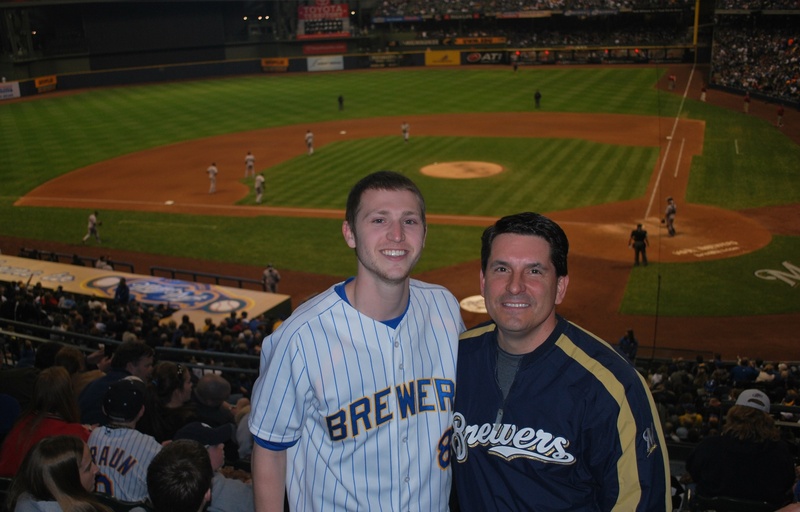 The Brewers had a runner on second with only one out in the bottom half, but couldn’t get the tying run home. The picture above is of Carlos Gomez (left), and Rockies second basemen Marco Scutaro (right). Gamel had doubled with one out in the ninth and Gomez pinch ran for him. He’s taking his lead as the pitcher was getting ready to go to the plate. I like the picture because you can see Scutaro in the process of slapping his glove, something infielders do to *try* and keep runners close. It’s done to make it seem like the fielder is close to the bag, and acts as somewhat of a distraction to the runner as well. The pitcher did try picking off Gomez twice at second, and was close on both attempts. 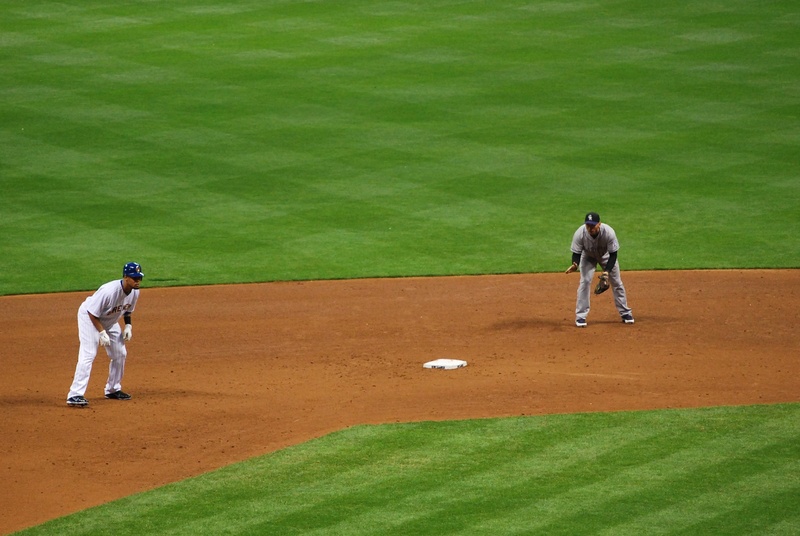 Gomez stole third with two outs, but was stranded when Lucroy struck out to end the game. Final score: Rockies 4 Brewers 3. The Crew need to get the bats going, so this is my advice: “Hit ’em where they ain’t!” That’s a quote from Willie Keeler, who played in the Majors from 1892 to 1910. I had a great time catching up with Mr. Johnson, and I’ll likely go to a few more games this year. I had a fan that was sitting behind us take a picture of Dr. J and myself at some point during the game. Let me assure you that the field wasn’t that dark, I guess that’s how my camera decided to treat the background. I did miss one pitch, I think, during the game. In the bottom of the fifth, with Gamel batting and a 1-0 count, a beer vendor was coming up the steps. He set down his bin just across the aisle from me as he talked to the fan who signaled for him. I looked inside his bin and saw mostly Miller Lites. I know they sell more Lites than MGDs, but I started wondering how many more. I’m a curious person and love statistics, so I started pondering. I probably still would’ve seen the 1-0 pitch, but as the beer distraction was ending, a four-year-old tripped and fell on the step right behind me. He didn’t cry, got up, and continued down the stairs with his dad behind him. I looked back to the field and the 2-0 pitch was being thrown. I’m not sure if at some point I caught the 1-0 pitch, but I’m not certain, I doubt it though. I wish I could lie about it and say every game was a perfect game, but I’m too honest for that. I pulled off my first successful bathroom break in the middle of the seventh inning. Yes, I had gone 13.72 games without going to the bathroom during a game. With two outs in the top of the inning I decided I was going to try. I raced up the steps and watched as Veras walked a batter, before finally getting the third out. There weren’t many people watching from the concourse, so I was able to stand a good 8-10 feet from the last row and still see the game, right across from the Men’s room. I got to the bathroom, there was no line, thank goodness, and made it back to my seat in time for the start of the Brewer’s half of the seventh. And yes, I washed my hands. Victoria will be joining me for Saturday and Sunday’s games. We’ll be staying with her Aunt and Uncle, who live in Sussex, allowing for some more sleep between the two games. 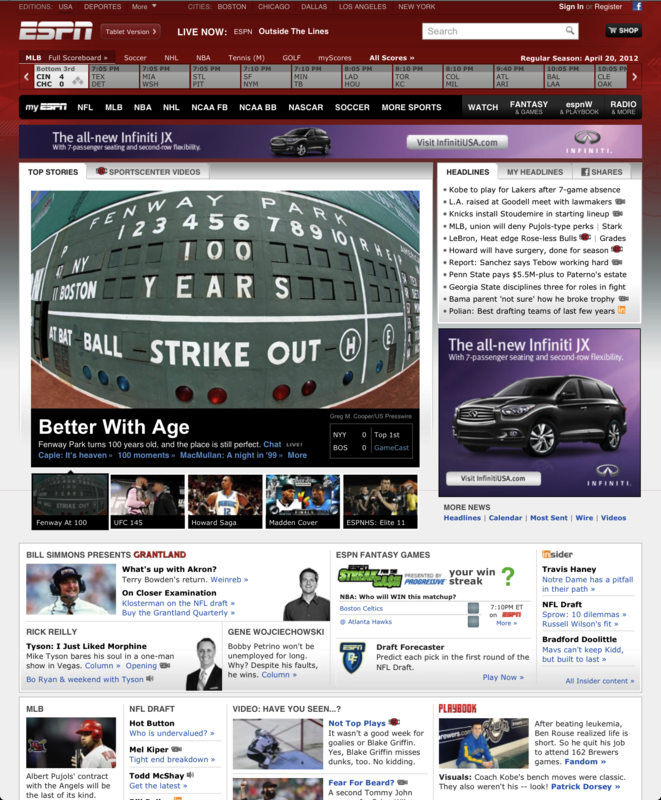 I almost forgot; the column stemming from the interview I did with Matt Lindner on April 9th at Tribune Tower in Chicago is/was on the front page of ESPN.com!!! I took a screen shot because I wasn’t sure how long it would be there (it’s in the bottom right of the image below. As of 2:03 am on Saturday morning, it was still there. You can get to the article by CLICKING HERE. It’s just crazy seeing MY NAME on the front page of the website, next to talk of Brian Wilson needing a second Tommy John surgery. That’s all for now, time for bed. hey man.i think what you doing is real cool keep up the good work .as a rockies fan wish you the best for the rubber game . Ben- If you need a ticket or a place to stay in San Diego – let me know. I have a great season ticket and a nice guest room.